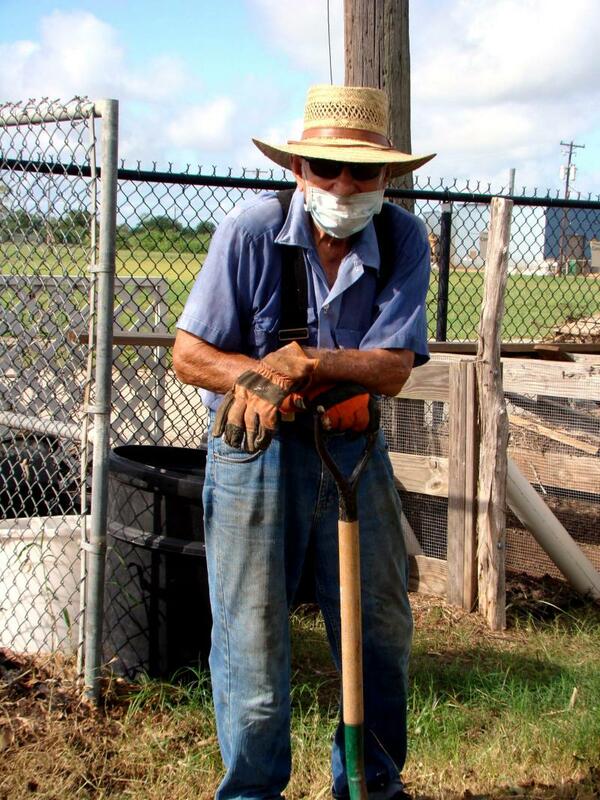 Longtime Master Gardener Ed Gregurek wears a protective hat, sunglasses and gloves as well as a mask for when summertime heat and dust aggravate his breathing issues. This blooming hibiscus plant thrives in full summer sun and heat with direct water supplied from a drip irrigation line at Victoria Educational Gardens. The dog days of summer are definitely here, and everything under the sun is suffering from the unremitting heat. While scalding Texas summers are nothing new, it seems we all forget how severe they can be from one year to the next. As such, it's a good idea to remind ourselves of the precautions needed to help plants, animals and humans survive the heat while waiting for the cooler days of autumn. Mulch, mulch, mulch. It's the best thing we can do for our gardens during summer heat. 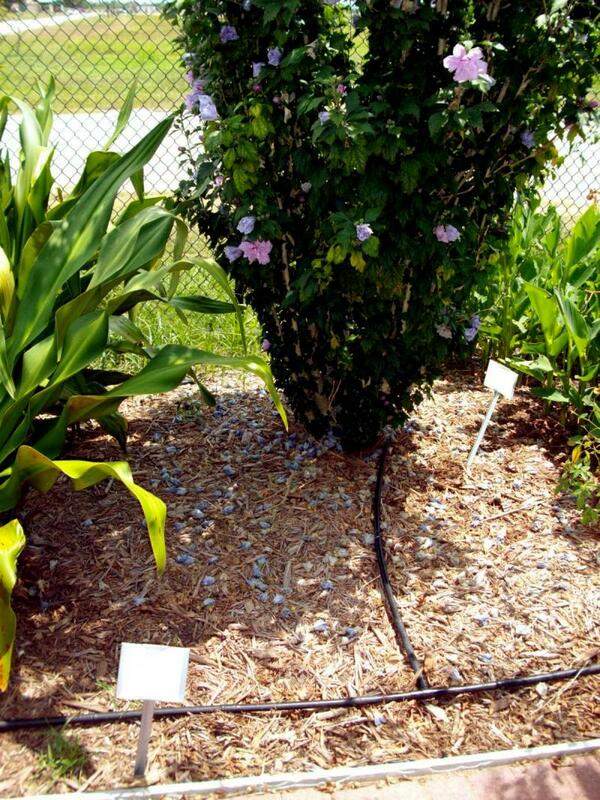 Mulch shields roots from heat, and it retains soil moisture. A 2- to 4-inch layer of organic material, such as shredded pine or cypress bark, can make all the difference in plant survival. As an added measure, stay vigilant about removing water-hogging weeds. Potted plants also benefit. In addition to putting mulch on top of the soil, consider further insulating sensitive plants by placing smaller pots inside larger ones - fill the void between the pots with additional mulch. 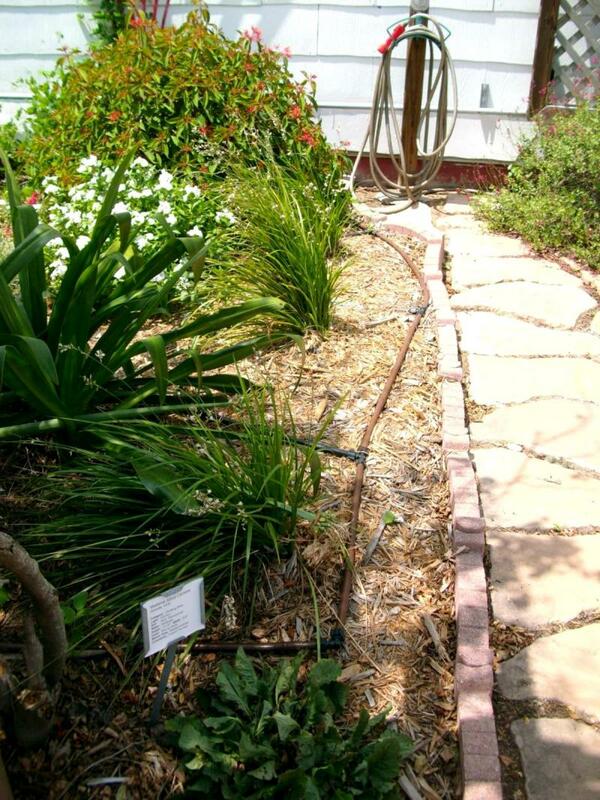 Wise watering practices go a long way toward plant survival. Broadcast sprinklers lose a lot of water to evaporation, so give consideration to using soaker hoses or drip irrigation where possible. Both these systems work at low volume and apply water directly where needed, resulting in reduced evaporative waste. Timers attached to faucets are convenient, and they are very useful if - like me - you tend to forget that hoses have been left running. If lawns must have broadcast watering, do so in the early mornings (preferably a couple of hours before sunrise) to decrease evaporation. 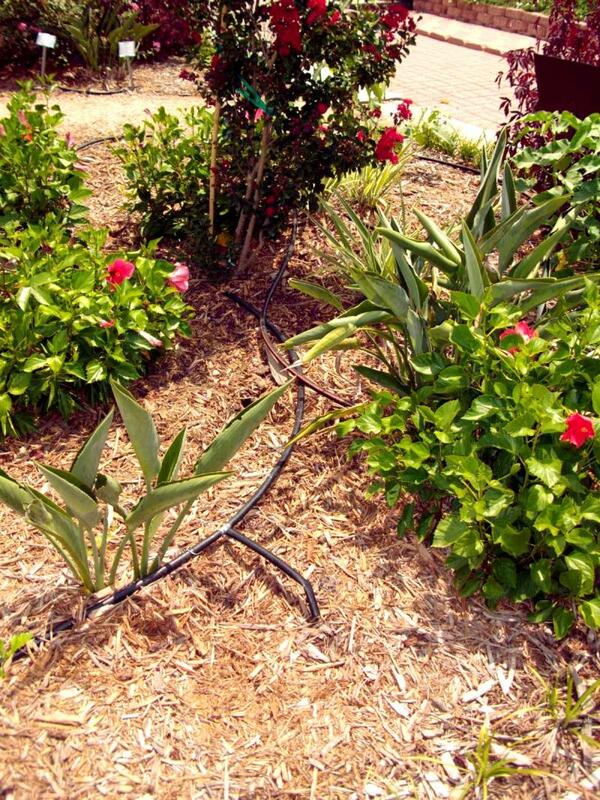 When watering trees, place soaker hoses around drip lines where feeder roots are located rather than near trunks. If trees show stress, overnight soakings are in order. Regardless of your preferred watering method, shoot for infrequent but deep watering (circa twice per week during summer heat). This encourages plants to send roots deeply into the soil. Frequent shallow watering can damage plants by keeping roots close to the surface and therefore more susceptible to heat and dryness. Watering early in the morning or late in the afternoon is traditionally considered the best time to water because it reduces evaporation loss and disease transmission and/or sun scalding. However, watering with soaker hoses or drip irrigation can be done at night since these methods do not splash water on leaves. In these scorching dog days of summer when it would appear that watering should be done whenever and however possible, remember to follow these suggestions - and to comply with municipal watering restrictions that may be imposed where you live. Lawns benefit from raised mowing heights during summer months. This helps insulate grass roots from heat, and it protects the ground surface from water loss. Take off no more than one third of the height of the grass blades and leave cuttings to provide insulation (and eventual fertilizer) for the soil. Deadheading, pruning and fertilizing (the latter in conjunction with adequate watering) can be continued to maintain appearance and to help plants prepare for fall blooming. 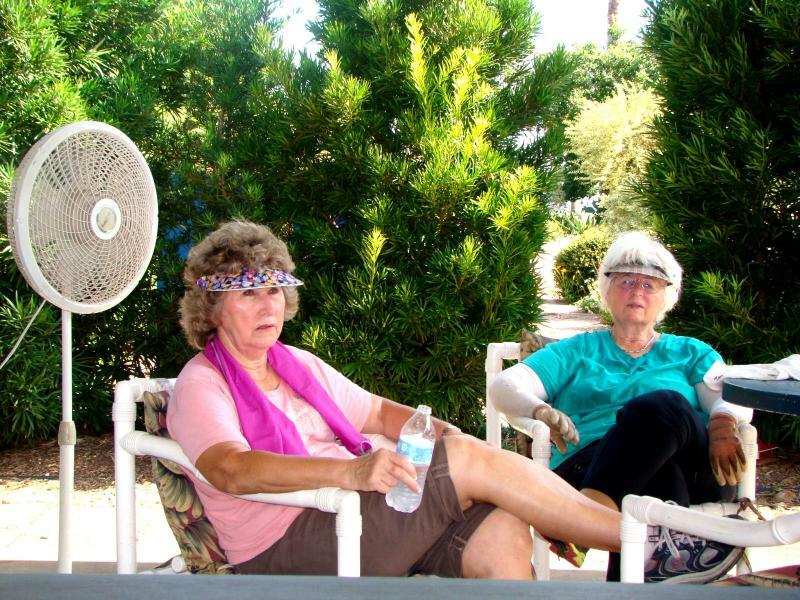 Every year, untold numbers of gardeners fall prey to heat cramps, heat exhaustion and heat stroke. Know the symptoms of heat stress and act accordingly. Drink plenty of water and electrolytes while working outside and take regular breaks to retreat to the shade or to a cool house. Wear loosely fitted, light-colored, open weave clothing and wear a wide-brimmed straw or cloth hat that can be dunked in water. A damp kerchief tied around the neck will help you to stay cool as will wetting your wrists with cool water from the hose. Speaking of heat stress, don't forget that birds and other small animals need water, too. Bird baths draw birds much more quickly than do feeders during hot summer months. Shallow saucers of water hidden in the shadiest flowerbeds are of particular importance to valuable bug-eating toads, since they absorb water through the skin rather than drinking it. Practicing wise mulching, watering and maintenance will keep our plants alive during the hot summer months. Much more importantly, however, being alert to the symptoms of heat stress will do the same for you and me. So while we do what we can to keep our lawns and gardens going during these hot summer months, let's also be aware of when it's time to go sit in the shade with our feet up, enjoying a nice, cool glass of electrolyte-filled sports drink. WHAT DO YOU KNOW ABOUT THE DOG DAYS OF SUMMER? Despite Southern sentiments when it comes to summer heat and panting dogs, the dog days of summer is actually an ancient Roman reference to when Sirius (the Dog Star) is in conjunction with the sun - from around the first week of July through the first week of August. Welsh, Doug 2007 Doug Welsh's Texas Garden Almanac. Texas A&M University Press.